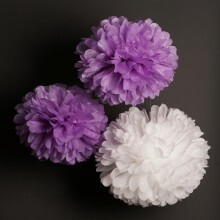 A magnificent set of 5 large white tissue pom poms. The mixed colours shown are a suggested combination only. Perfect for party decorations or adding everyday merriment to your home. These do it yourself kits include the wire and the tissue to make five pom poms. They are available in a range of colours.